When our clients make the final decision to end their marriage, they do so after long deliberation and careful thought. It’s a difficult, intensely painful decision, and we know it’s not one you’ve made easily. Having made the decision, it’s time for you to start thinking about the logistics of actually pursuing your divorce. There’s no need to make any rash decisions – you want to be as informed as possible so that you can make these important decisions intelligently, without regret. At Split Simple, we’ve pioneered an uncontested divorce process in Denver and a Chicago divorce mediation process that fits the needs of our clients. Still, there are some steps you can take after making your decision that will make this process smoother and simpler. If you want to learn more about divorce mediation, please call Split Simple today at (855) 665-9920 or contact us online. Some of what we’re about to advise might seem obvious. But it’s our experience that these things need to be clearly stated so they can be more easily remembered. It’s quite easy for “obvious” considerations to get lost in the emotional wreckage that’s lying around after the decision to undergo a divorce is made. Keep calm. Do not let your emotions control you. Instead, it’s important to see your divorce through the lens of a business decision. This is vital advice at just about any point in the divorce process, of course, but emotions are particularly raw right after a decision is made. Don’t engage in petty vandalism or theft. Make sure all the communal property of your marriage is in good shape and well-documented. Assemble as much financial documentation as you can – tax returns, pay stubs, bank statements, credit card statements, etc. Anything you can think of. The more information everyone has, the better your eventual settlement will be. Research your legal options online and you will find that Split Simple offers the perfect balance between obtaining an understanding of the legal issues in this life changing event, but still achieving a significant cost savings versus the traditional courtroom divorce process. Ultimately, our divorce mediators located in Denver and Chicago provide you with the information you need at this critical time without releasing control of your life to others.” Read up on Split Simple, then contrast our process with the reality of a traditional courtroom divorce. Decide if divorce mediation is an appealing option to you. Begin preparing for your mediation session. 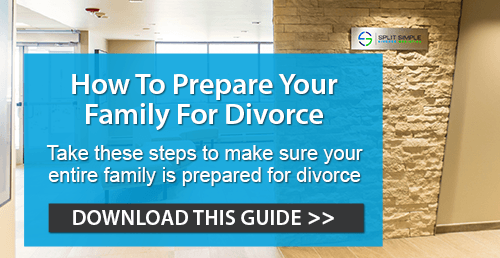 The decision to undergo a divorce is a significant one, and it will take your life in a new direction. Split Simple is committed to helping you find the right path for you and your family, all while saving you time and money. If you’re considering a divorce and want to learn about your mediation options, please call our expert divorce mediators located in Illinois and Colorado today at (855) 665-9920 or contact us online.